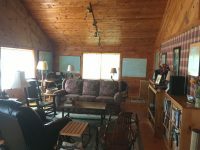 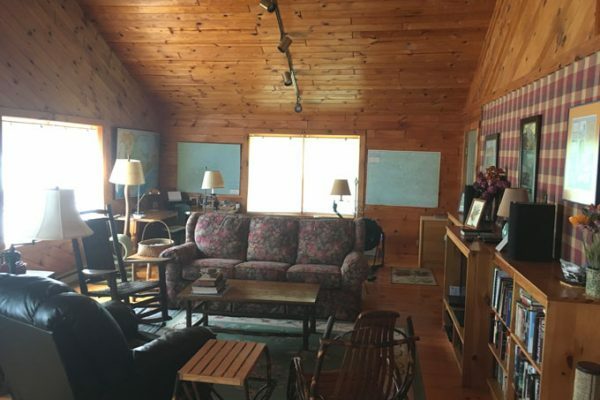 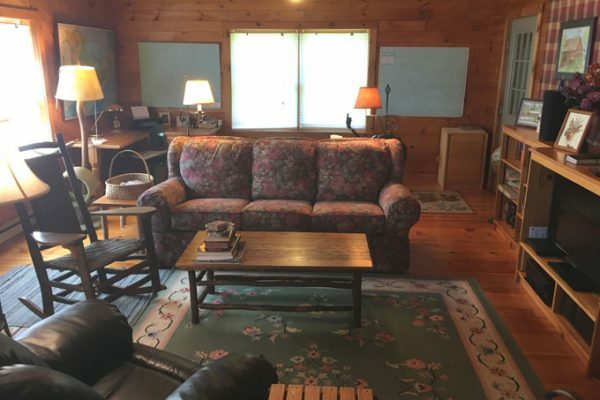 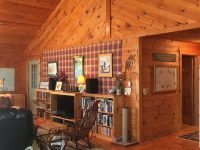 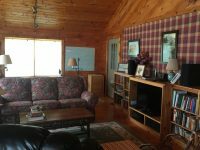 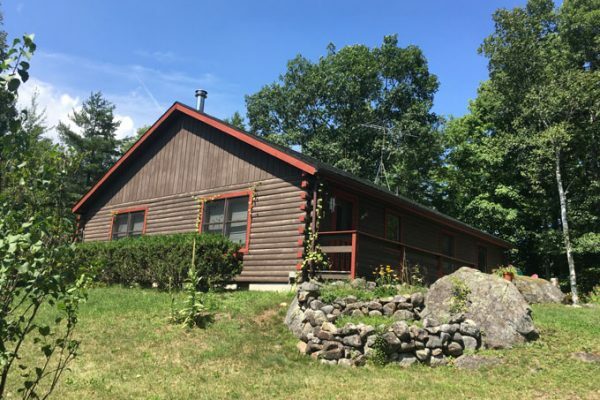 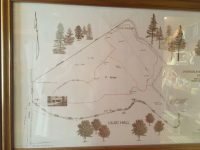 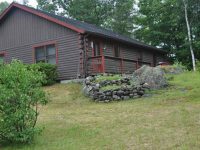 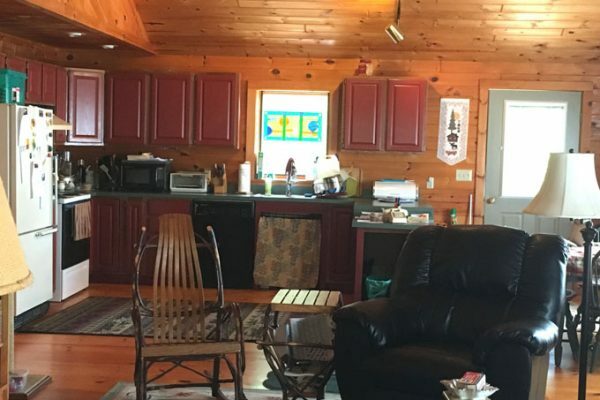 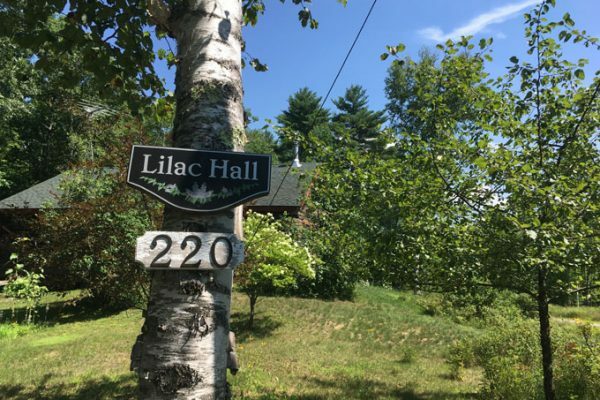 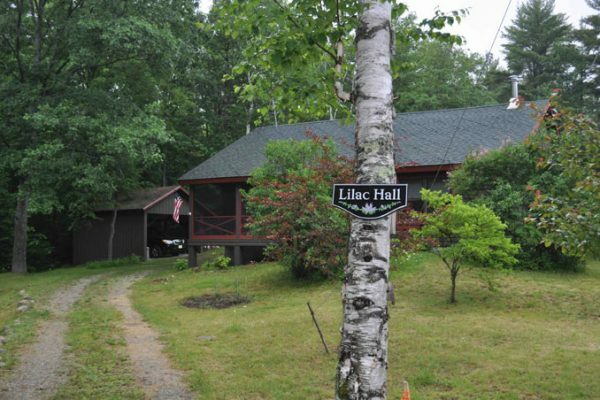 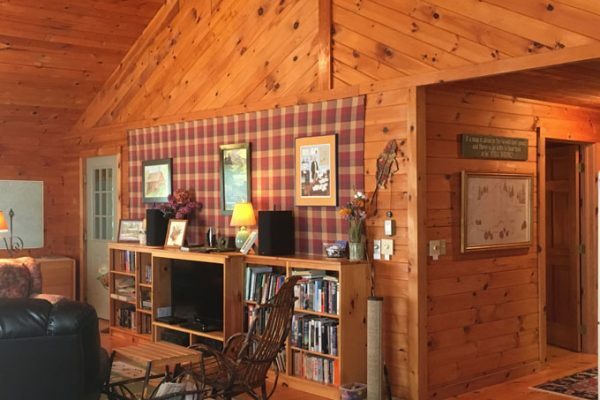 Lilac Hall is a spacious and attractive 2 bedroom log home on a lovely country road. 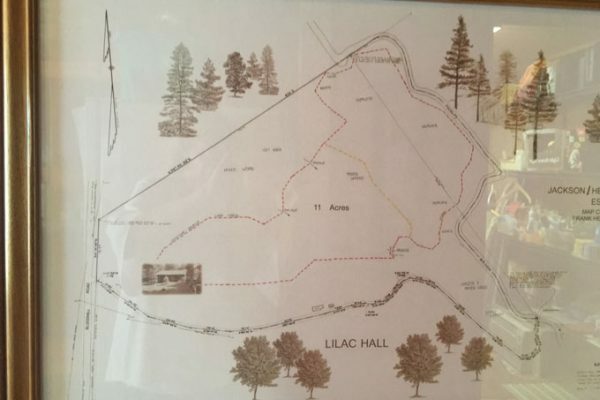 It is surrounded by nearly 12± acres of land. 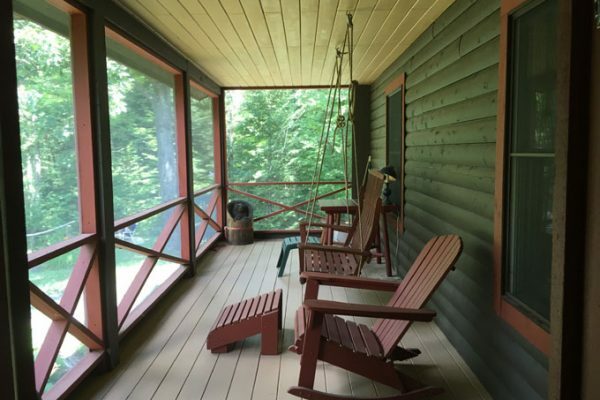 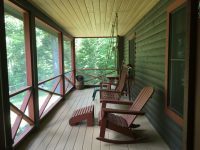 A porch across the back of the cabin overlooks a gentle hillside with a deck and sitting area at the top of the hill. 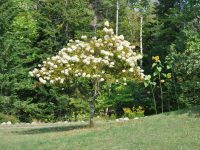 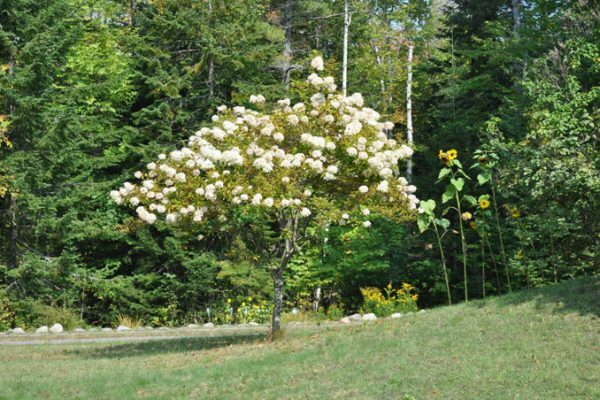 There are a variety of small gardens and pretty trees in other areas of the lawn . 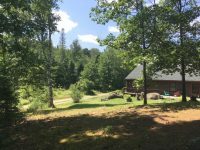 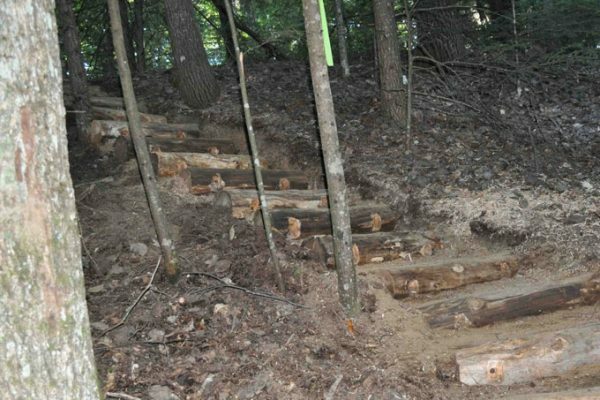 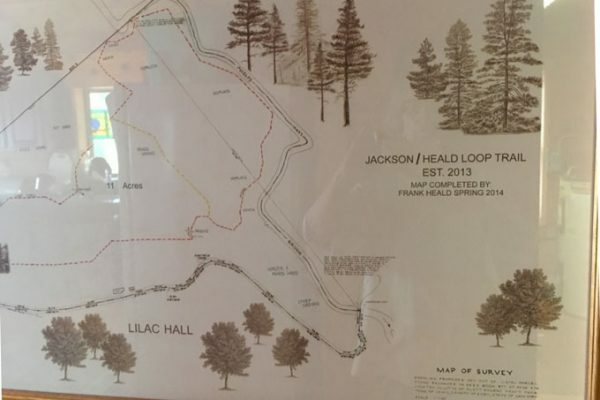 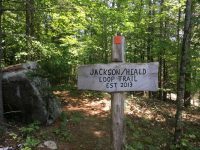 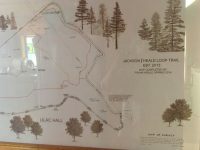 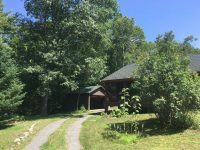 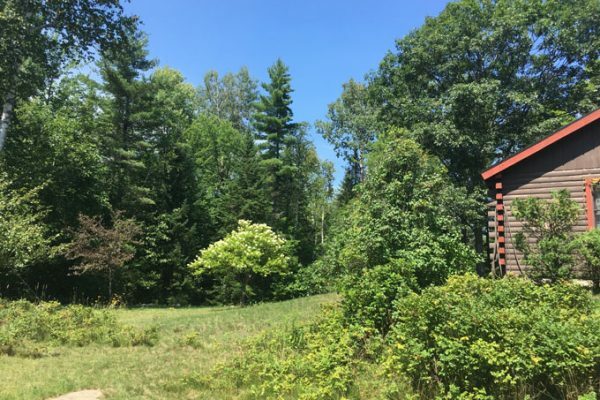 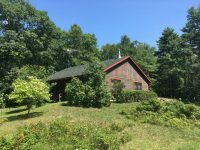 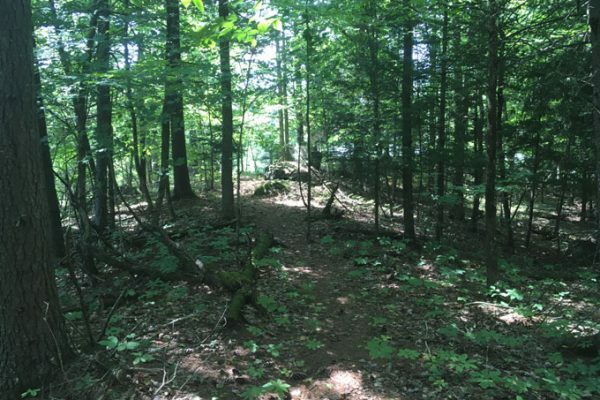 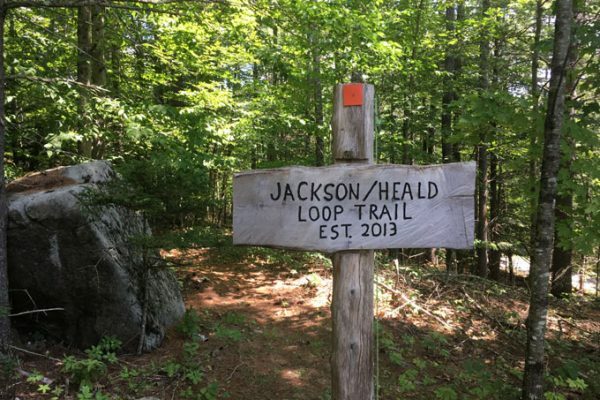 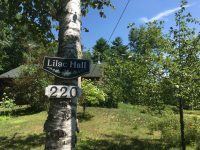 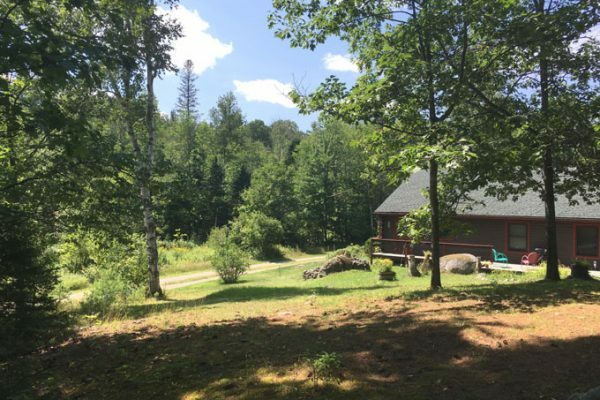 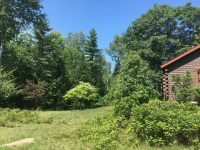 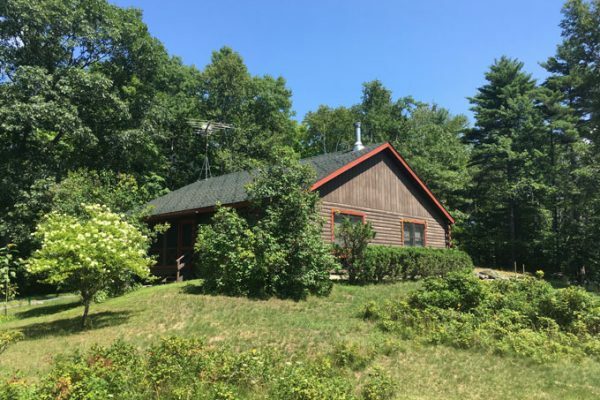 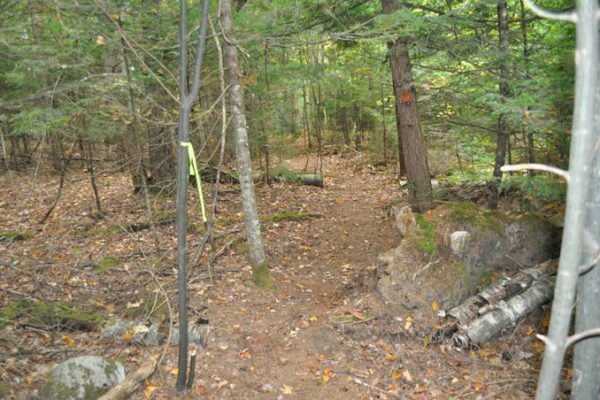 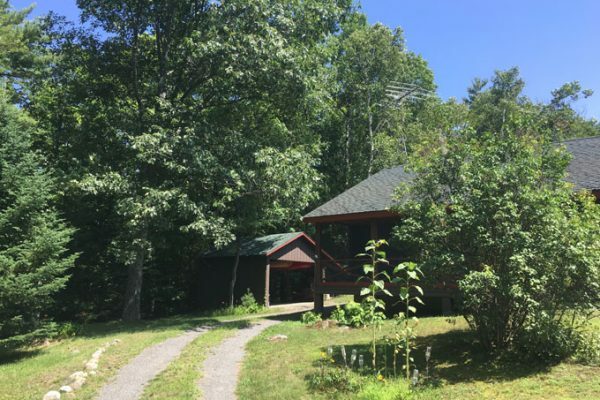 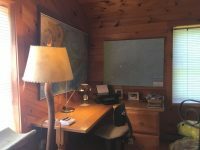 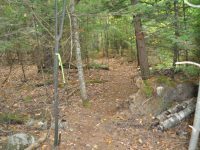 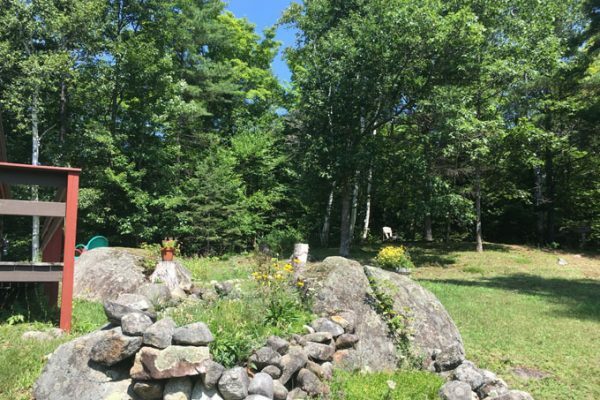 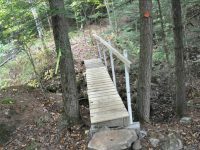 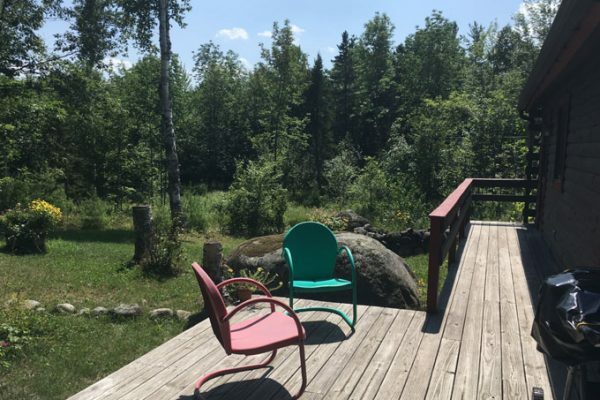 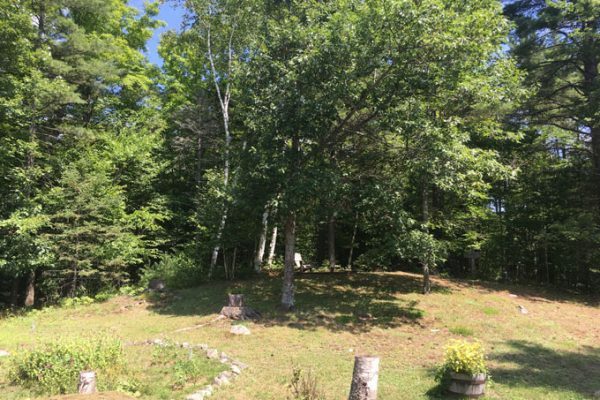 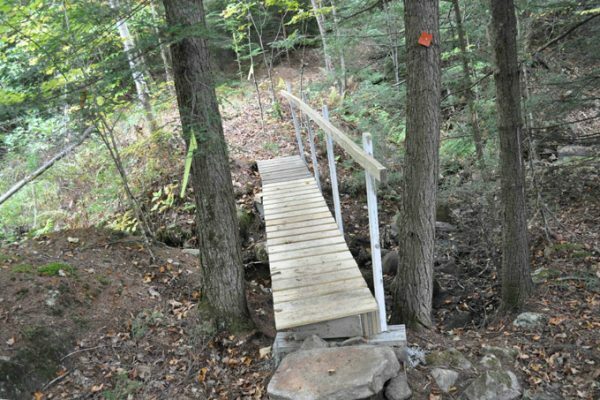 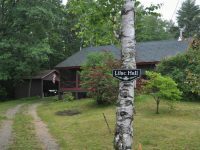 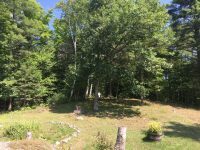 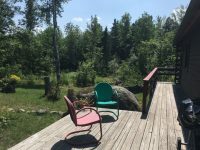 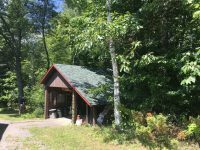 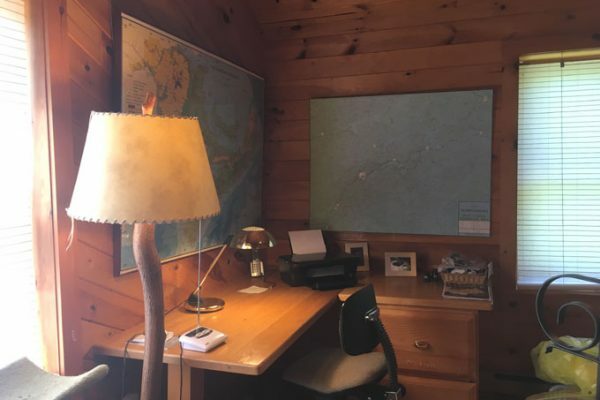 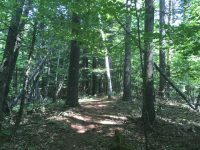 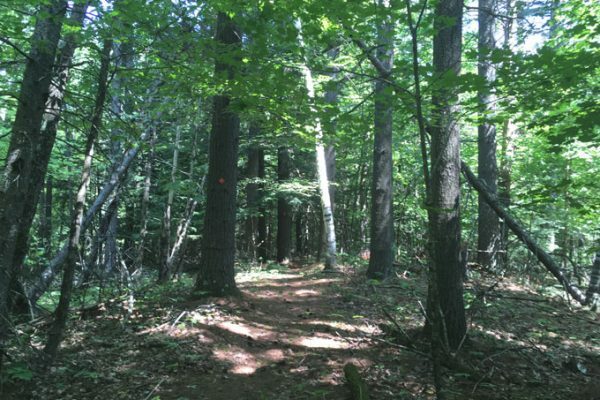 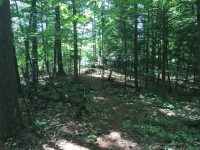 One of the very pleasing features of the property is a charming walking trail starting at the top of the hill behind the cabin and winding along Phelps Brook. 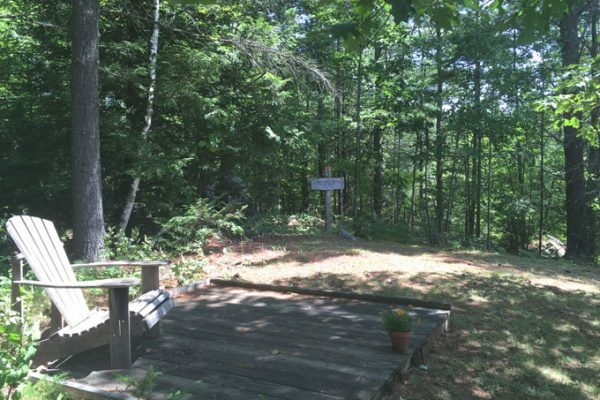 Handsome benches are stationed in special places along the path, inviting one to spend quiet moments reading a book or taking time out for a picnic lunch. 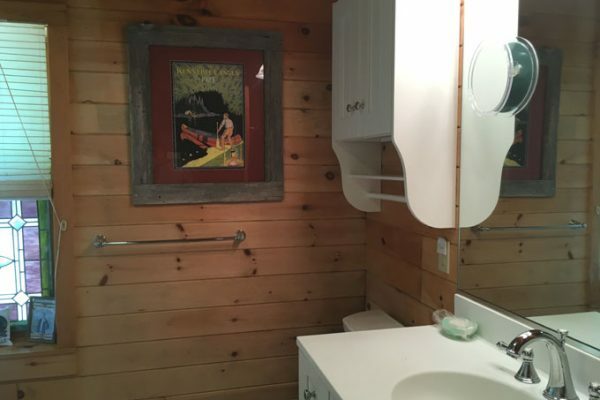 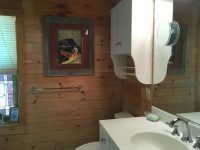 The one story cabin has been carefully maintained. 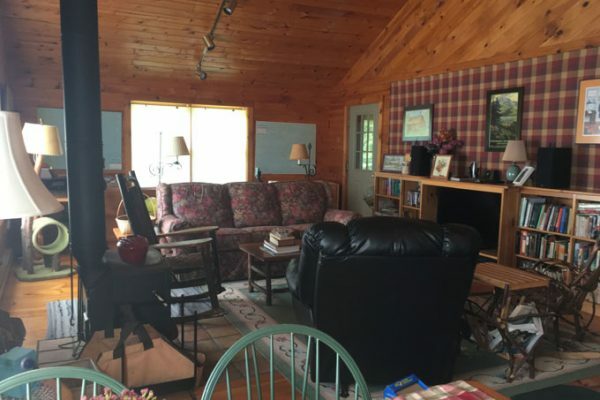 It has a 24′ x 8′ screened porch overlooking the front lawn and gardens. 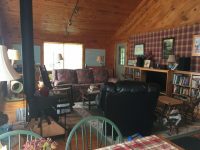 Inside is a big beautiful open living/kitchen/dining area with high ceilings and lots of windows. 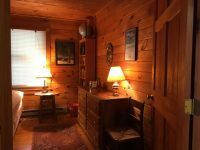 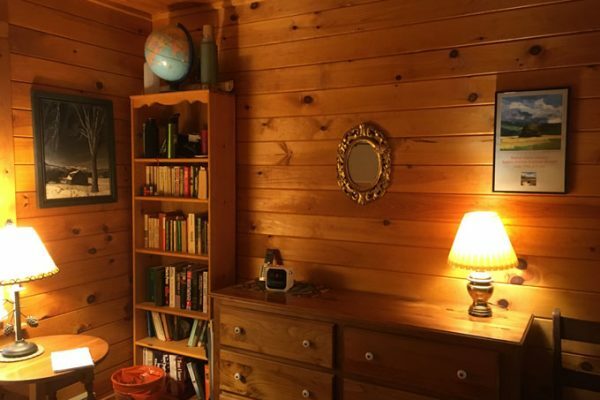 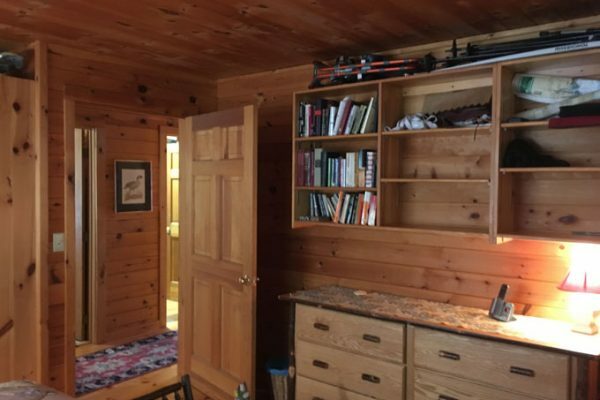 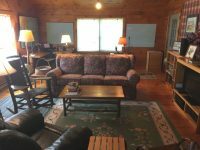 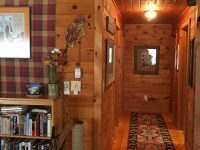 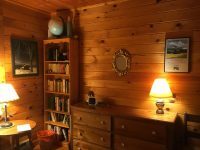 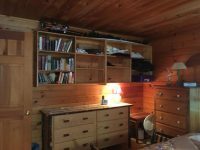 Walls, ceilings and floors of the home are knotty pine which has been artfully applied and finished. 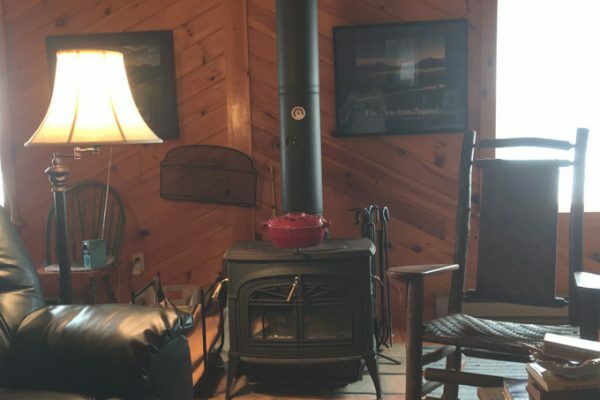 A wood-stove heats the cabin in winter and keeps it cozy on cool mornings or evenings. 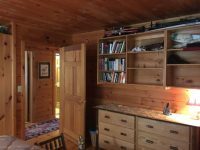 A corner desk has been built in and a wall of bookcases across the room includes spaces designed for television and other electronics. 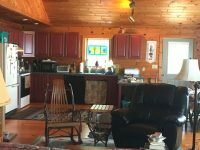 There is a pretty view from the window over the kitchen sink. 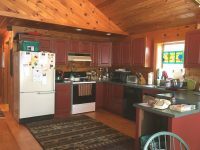 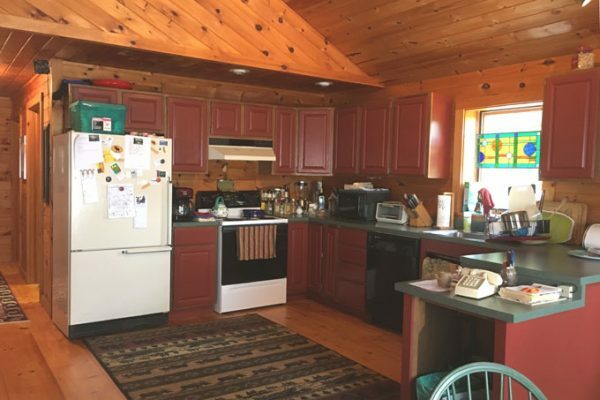 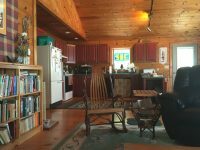 There are sufficient cabinets and counters along with an electric stove, a dishwasher and a refrigerator. 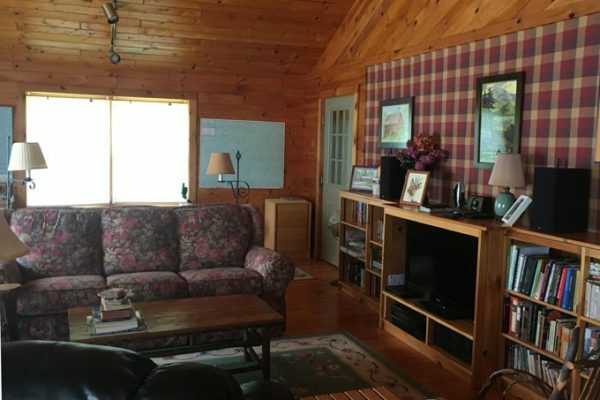 At the end of a short and wide hall is the spacious master bedroom with an adjoining bath. 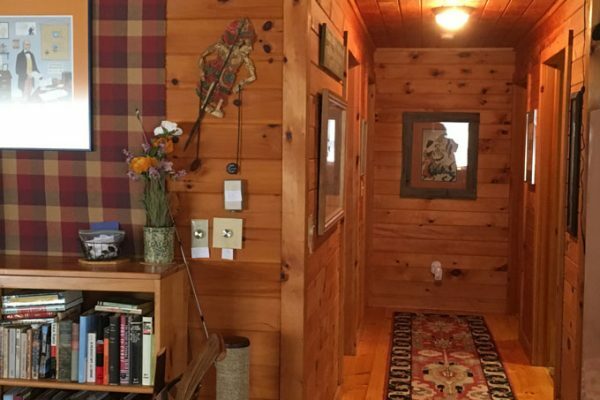 A smaller bedroom , a laundry-utility room and a large guest bath are also reached through this hall. 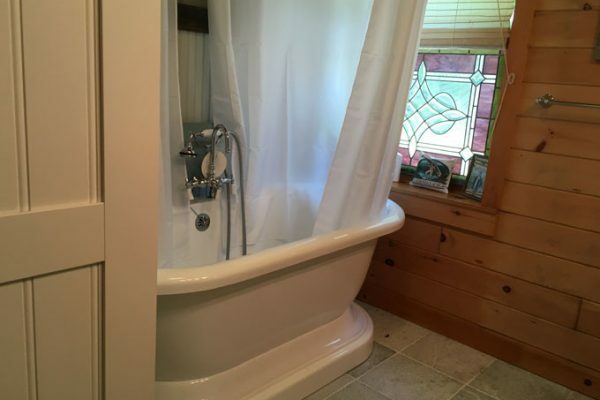 The baths have attractive tiled floors and new fixtures, having recently been upgraded. 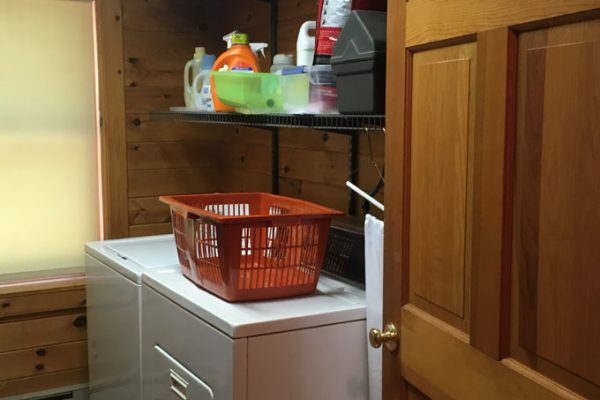 The laundry room is outfitted with washer and dryer and has many shelves for storage of various items. 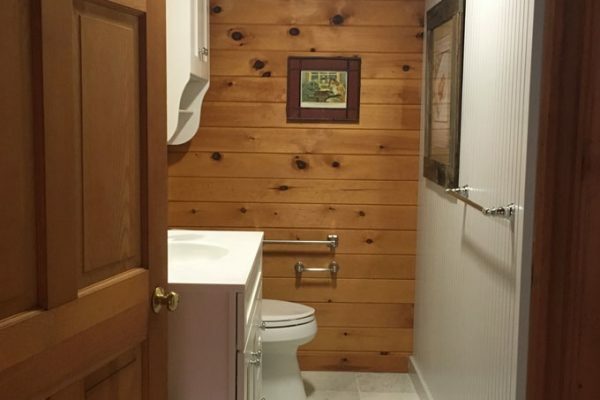 All of the doors are wide enough to accommodate a wheel chair comfortably. 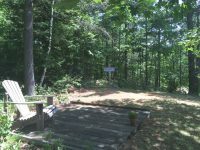 A carport is not far from the back deck. 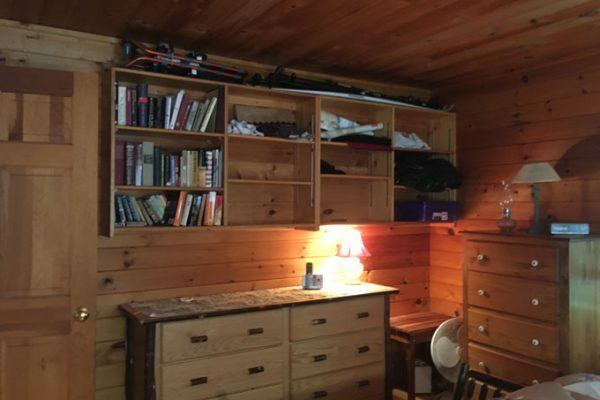 It can house 2 cars and also serve as a good storage place for sporting equipment and other items. 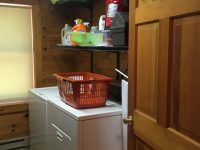 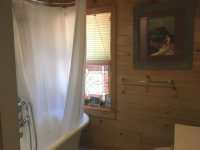 The exterior of the cabin is easy to maintain with washing from time to time. 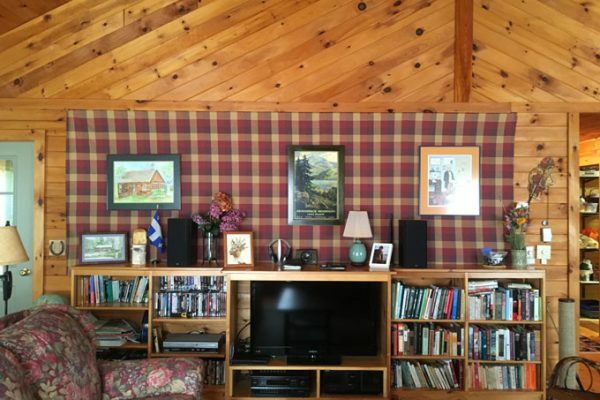 It has needed to be re-stained only twice in the past 20 years. 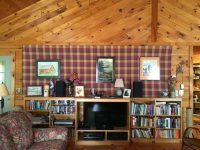 Built by local contractor, Robert Beaton in 1989, the property is well insulated and easy to keep warm. 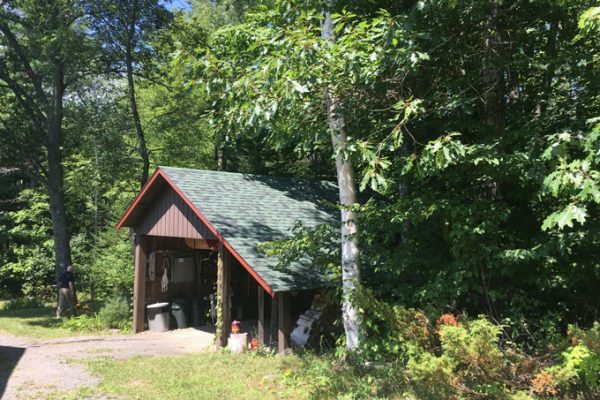 The asphalt shingle roof of the house is 8 years old and the roof of the carport was replaced two years ago. 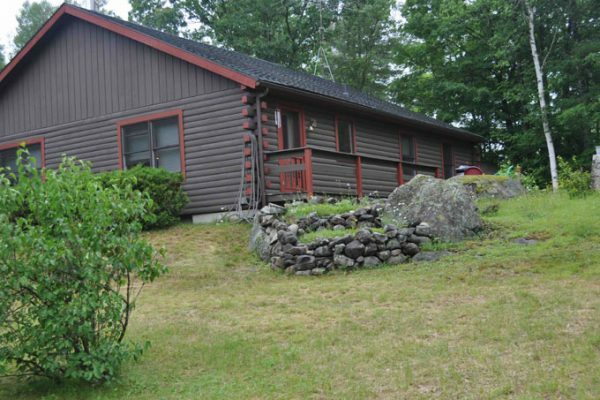 There is a poured foundation with a crawl space under the whole building. 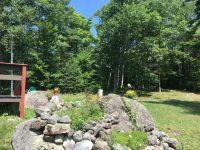 A drilled well provides water to the property. 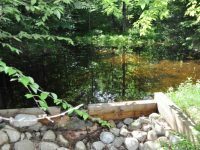 A new pump was installed in the well a year or two ago. 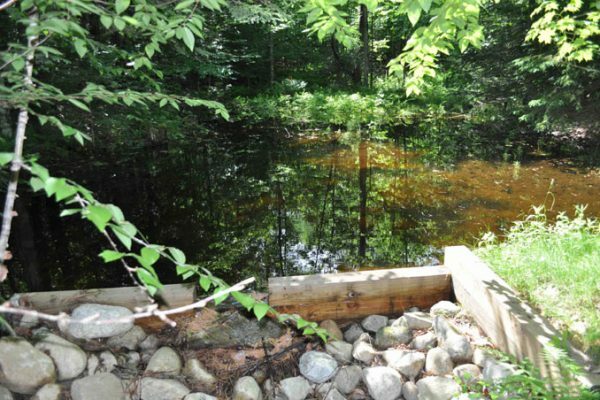 An individual septic system has a large cement tank and is located on the opposite side of the dwelling from the well. 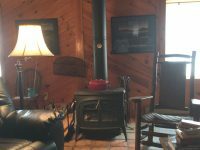 Electric baseboard heat has been installed to back up the wood but has seldom been used by the current owners. 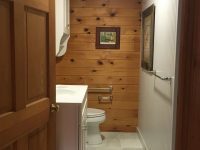 The property can be easily drained so that the heat can be turned off for the winter, if desired. 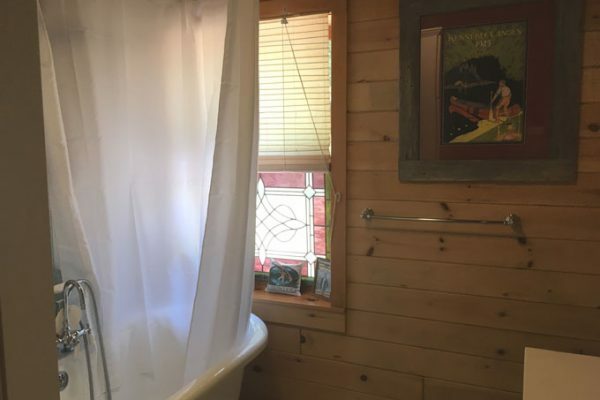 A few furnishings may be available for purchase and 2 stained glass pieces currently in front of kitchen and bath windows are available for purchase. 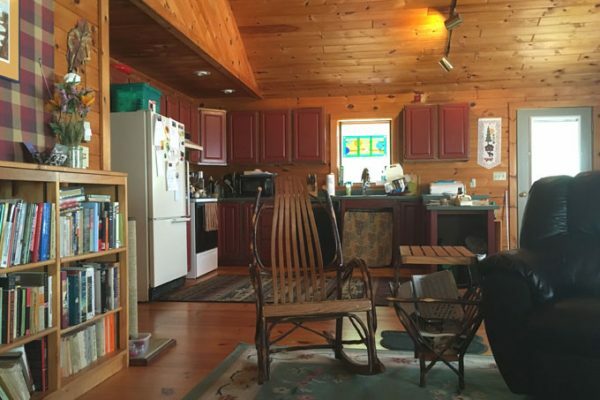 If you are looking for a quiet refuge not far from Elizabethtown, Westport and Keene, this is it!